I'm going to visit Lego House in Billund, though my hotel is in Kolding since it is cheaper. I plan to take the bus 166. 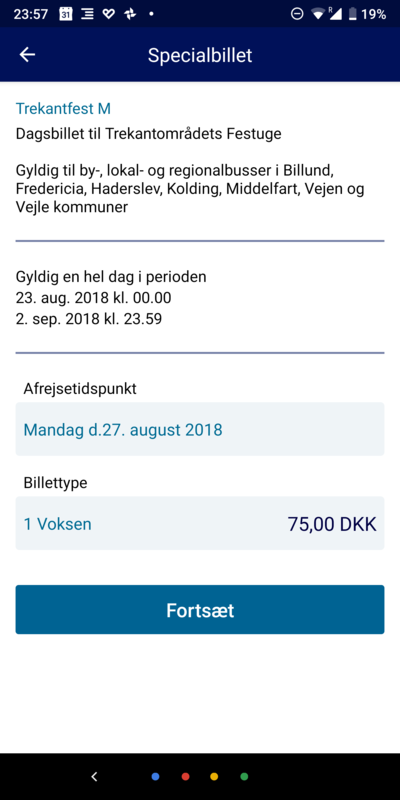 A one-way ticket seems to cost 72 dkk though it seems that there is also currently this ticket called "Trekantfest M" available at 75 dkk for a local art festival. Unfortunately the description is in Danish, so I'm not sure if this will indeed allow me to take bus 166 twice in the same day, i.e. whether the "lokal/regionalbusser" includes the bus 166. Should I buy this ticket? Is there any other day ticket that might be the most economic for me? As a native Dane, I would definitely consider "by-, lokal- og regionalbusser" to include that route. The geographical area matches too, and it explicitly says it is valid all day, so I'd say you're good to go with that ticket. Not the answer you're looking for? Browse other questions tagged tickets buses denmark day-trips or ask your own question.